My copy has all 10 tracks and pretty decent sound reproduction for a bootleg. Several impurities in the clear vinyl but that's to be expected. One of the most interesting releases currently on this site, if vice ever does a video on it, quote me. Lots of surface noise. Not terribly impressed. Also, the jacket is significantly smaller than a standard LP jacket. The inner white sleeve sticks out a small amount on the side, and it was not shipped with one, just had the record inside the jacket. Not a bad pressing at all! There is a skip in Bound 2, the album is noisy, and inner groove distortion really rears its head here; Hold My Liquor and Bound 2 sound awful. 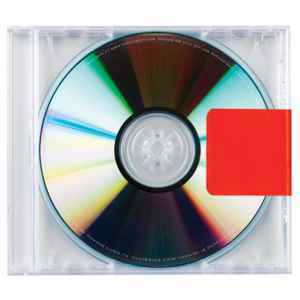 If you really love Kanye and need Yeezus on vinyl, this definitely isn't the worst possible bootleg out there. Just don't buy this expecting the best quality ever since, you know, it's a bootleg. GREAT album, sleek and innovative cover design going with the blank cover. Annoying that it's an actual sticker (with mine I peeled it carefully so that the red would still be on the cover LMAO) the CD comes loose in the case very easily, so it is frustrating having to put it back in over and over. Other than that it's great love the album. We have this copy for sale, in case anyone is looking for it. Get in touch with us and we can deal it. They should have altered the artwork photo to vinyl for a vinyl release. It doesn't make sense to have a cd inlay at 12" format. Very noisy, almost too noisy. Also mine was quite warped. Otherwise a decent copy - did notice some strange distortion going on with Bound 2, but no skips like I've read about on other pressings. As expected, this pressing is pretty awful. The surface noise is incredibly present and becomes unbearable on some tracks, notably Blood On The Leaves. On top of that, the music is pitched up very notably, almost to the point of it becoming comical. Also, the Bound 2 skip issue on other pressings is also here. I say cop it if you want a Yeezus boot, but it isn't something I'd listen to casually. The orange vinyl looks pretty dope though. EDIT: The high pitch issue is only present on the first 2-3 songs on each side.